It is rare to hear environmental scientists sounding positive about the future. But that’s exactly what’s happening now with an international group of researchers. Because over the past two years, they have been gathering examples of positive initiatives of various kinds from communities around the world. These range from projects involving community-based radiation monitoring in Japan to ones designed to create healthier school lunches in California, to puffin patrols in Newfoundland that save baby birds from traffic. These researchers believe that there are aspects of these projects that can be used either alone, or in combination with one another to build a better, more sustainable future. The researchers have analysed 100 of the more than 500 projects that have been contributed to the website they have created, Good Anthropocene. As a result, they have identified some of the overarching trends in community initiatives that they believe can potentially play a role in creating a future that is both more just and more sustainable. 1. Agroecology – these projects generally adopt social-ecological approaches to enhancing food-producing landscapes. One example is the Satoyama Initiative in Japan where urban residents are working with rural people to revive underused rural lands through farm stays and volunteer work along with financial support. 2. Green Urbanism – these are projects that focus on improving the liveability of urban areas. New York City’s Highline Park, where native species have been planted on abandoned railway lines to create urban spaces where art, education and recreation intersect and are accessible to all. 3. Future Knowledge – these are projects which foster new knowledge and education which can be used to transform societies. One example is Greenmatter, a program in South Africa to provide graduate-level skills for biodiversity conservation. 4. Urban Transformation – these projects work to create new types of social-ecological interactions around urban space. One example is the Sukhomajri village in the Himalaya’s where the community became well-known in the 1980s for coming together to stop Sukhna Lake from silting up as well as for harvesting rainwater, and in the process transforming their village. 5. Fair Futures – these projects aim to create opportunities for more equitable decision making. One example is City of the Future Lüneburg 2030+ - a project that aims to envision the future city of Lüneburg, Germany in a way that it turns into more sustainable, livable and fair place. The project has been jointly developed by the sustainability oriented University of Leuphana, the local government of the Hanseatic City of Lüneburg, local NGOs and business as well as citizens. 6. Sustainable Futures – these are social movements to build more just and sustainable futures. One example is the US based Farm Hack project that was founded in 2010 by farmers and organizers who use the internet to share new ideas about food production and innovative tools to increase the resilience of sustainable agriculture and rural economies. 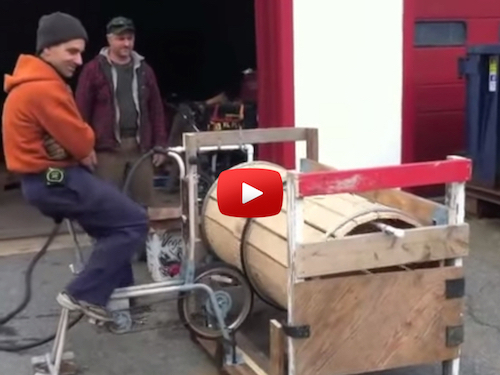 One example is a bicycle powered root washer. The researchers invite those who are involved with sustainability projects of various kinds around the world to go to the Seeds of a Good Anthropocene website and contribute them. “Seeds of a Good Anthropocene” is a collaboration led by McGill University in Canada, the Stockholm Resilience Centre at Stockholm University in Sweden, and the Centre for Complex Systems in Transition (CST) at Stellenbosch University in South Africa. It forms part of the initiative “Bright Spots – Seeds of a Good Anthropocene,” a FutureEarth funded project. This research was supported by Future Earth, The Swedish Research Council Formas, Stockholm Resilience Centre, Sweden; Program on Ecosystem Change and Society, ecoSERVICES, the SwedBio programme and the Natural Sciences and Research Council of Canada (NSERC).